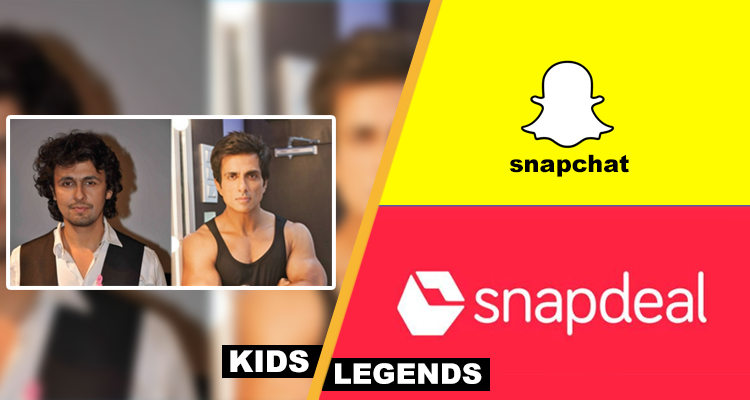 Snapchat & Snapdeal, Sonu Nigam & Sonu Sood all mixed up story! Home BOLLYWOOD Snapchat Snapdeal Sonu Nigam Sonu Sood Snapchat & Snapdeal, Sonu Nigam & Sonu Sood all mixed up story! Many of Indians boycotted the app after CEO of Snapchat apparently called India a poor nation. But little did they know about the organisation in the talks. They got confused between Snapchat and Snapdeal and the former company had to face the backlash for something they never did in the first place. After Snapchat-Snapdeal mix up people got confused for two celebs one more time. Sonu Nigam says ‘woken up by Azaan’, calls it ‘forced religiousness’, ‘gundagardi’ he recently tweeted "God bless everyone. I'm not a Muslim and I have to be woken up by the Azaan in the morning. When will this forced religiousness end in India". Confusion over names created trouble for Sonu Sood and the latter is facing mean trolls on Twitter. However understanding the situation extremely well, Sonu Sood reacted peacefully and tweeted “I am still wondering WHO said WHAT n to WHOM n WHO’S asking me to find out WHAT happened WHERE”.